Funny how my kids love those little hand stamps they receive at the entrances of museums, zoos, etc. Here's an unusual way to get a personalized stamp--using tissue paper instead of an inkpad. 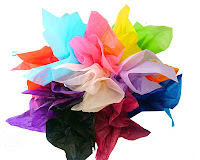 Choose a piece of tissue paper that's dark or bright. Cut out a shape that is small enough to fit on your child's hand. Moisten the back of her hand with a bit of water, then press the shape down on it. Smooth the paper down. Peel the paper away to see the tissue transfer. From an old Parenting magazine (May 2006) that I found in my laundry room closet.